For those of you currently blessed with youth, Moynihan was a scholar, US ambassador, a New York State Senator and a very influential intellectual in the waning decades of the 20th Century. (It still feels odd for me to say it.) At the time he wrote his report, he was ensconced as a young career civil servant in President Johnson’s administration on the eve of passage of the civil rights bill. He was one of many invisible administration officials who work behind the scenes in every public administration in government. He would have been a colleague of Bill Moyers and Chris Matthews, all of whom were among the anonymous legions that make governance possible in every administration. Moynihan’s report was a prescient analysis of critical social problems that foreshadowed the accumulating impacts of structural racism, including mass incarceration and the ongoing destruction of black families today. 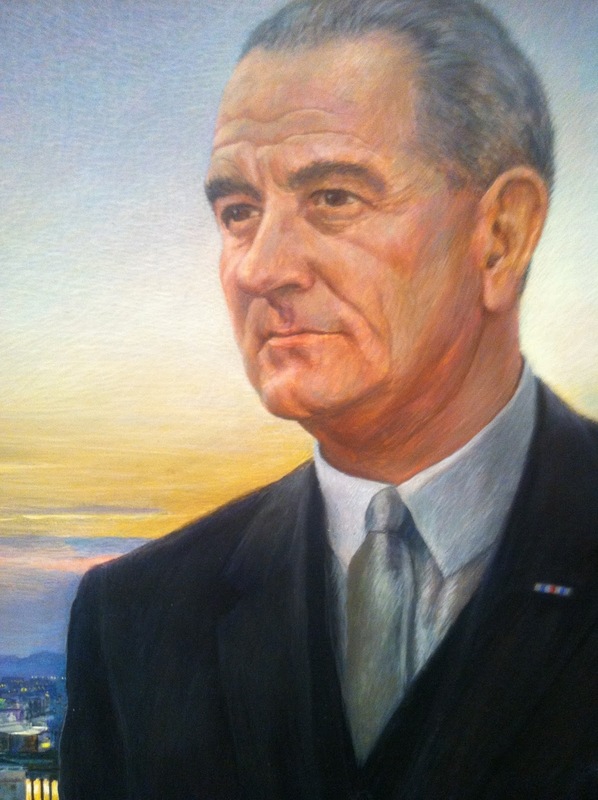 His report made enough of an impact on Lyndon Johnson’s thinking that it was the subject of a subsequent speech that Johnson gave on the breakdown of black families in June of 1965. The speech was written, in part, by Moynihan himself. Johnson understood Moynihan’s point that white structural racism was responsible for the ongoing destruction of black families. Johnson’s message in that speech, however, was quickly turned upside down in a social atmosphere that was in no mood to accept any blame for the plight poor black communities. The unreceptive public, and the media interpretation assigned to the Johnson’s speech, was that the root of poverty and social ills in the black community was a result of a weak black family structure, and of black males in particular. Moynihan’s report was only an internal administration document at that time. Coates writes that Moynihan printed one-hundred copies of the report, submitted just one copy and kept the other ninety-nine copies in a safe. Moynihan had also removed from the report a whole section he had written on government policy recommendations for solving these problems. His rationale for this omission was that squabbling over proposed solutions would distract from sounding the alarm bells and raising a discussion on the plight of black families. While the Moynihan report was not a public document at the time, internal discussions of the report spilled into the public domain and became a matter for public speculation. The false narrative that black families are responsible for their own social ills was ascribed to him and Moynihan was ridiculed by social activists for the black community. A moment had passed, the damage was done and the inverted perversion of Moynihan’s report seeped into the public consciousness despite efforts to dispel it. Much more can be said at this point about the subsequent history of government policies and the negative impacts it has had on black families. This is covered quite well in the subsequent eight chapters on Coates’ article, and again I recommend you read it. 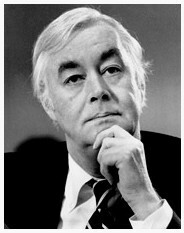 My own experience working with public welfare families over the past three decades affirms Moynihan’s views and his criticism of the matriarchal federal public welfare system. I hope to say more about this in the future also, but in part II of this article I want to shift gears and focus attention on that tactical decision the young Daniel Patrick Moynihan faced when he pull his policy recommendations from the original report. In doing this an important lesson may be learned about elevating a social problem to the level of a public issue within the context of the times. Where there alternatives might have been more effective? Would having raised a social problem to a public issue failed to happen if he left his proposed solutions in the original report? And what is it about the compressed and rarified air where civil servants work behind the scenes of public administrations that would cause him to lock up ninety-nine copies of his original report? The first time I saw a version of the graph below, depicting how worker compensation suddenly diverged from national wealth, I was horrified. My statistical training caused me to see right away that something took place in the mid-1970’s to stifle the rise of worker compensation. And the gap between wages and wealth keeps growing every years. I have written several articles about it since, but the implications have still not penetrated our public awareness. 1. The trend of the two paycheck family led to a weakness in the labor force’s ability or need to demand higher compensation. 2. Expanded social service programs and income eligibility caps aid to the working poor created incentives for workers to keep their compensation low so they qualify for government assistance. 3. Employer fixed benefit packages reduced competition for the affordable healthcare, driving up insurance costs since individuals were not “shopping around” for competitive bargains. Let’s begin with the last point; fixed healthcare benefits. If these were anti-competitive purchases by employers, the rise in employer costs for these programs would correspondingly raise, not lower, hourly worker benefits. The more an employer pays for employee health insurance, the higher the wage compensation is per worker. Healthcare costs have risen faster than inflation. The reasons for this are many, but the topic is too broad to address here except to say that higher insurance costs led many employers to drop healthcare coverage for their employees. This is a factor contributing to the lower growth in wage compensation. Note, however, that the flood of individuals entering the private health insurance market corresponds with the period of high rising premiums, not lower rates. The collective bargaining leverage of large corporations for competitive health insurance bids was actually a constraining factor on policy costs. To the main point, the impact of two paycheck families on wage compensation: Is there evidence that the gradual transition to two paycheck families contributed to lower hourly wage compensation? I believe the graph above provides the answer. First, the wage/wealth graph above represents actual, verifiable economic data collected over a span of seven decades. It is not a trend graph, but you can easily imagine superimposed trend lines on it. The first would be a linear line rising steadily upward and to the right representing hourly Gross National Product (GDP). This is a measure of our nations’ wealth and it has been steadily growing. The second trend line, representing hourly wage compensation, would rise perfectly in step with GDP from 1947 to 1973 (which is also the period of rapid expansion of the American middle class). Then it bends sharply (if somewhat erratically) over a seven year period before settling back into to a straight, but much shallower trend line. Superimposing a trend line on worker compensation data reveals that there was a brief transition period from 1973 to 1980 during which the growth rate of worker compensation radically changed. The gap between new wealth and wage compensation has grows wider every year since. What does this mean? It means the social forces that altered wage compensation began abruptly and remained active over a brief period of seven to eight years. The social forces created a persistent structural change in America’s hourly wage compensation that remains in effect today. It means that long term social trends don’t account for this structural change because they don’t fit the data. Long-term trends present as long slow arches rather than sudden bends in a trend line. This means that the social actions that permanently altered the wage and productivity balance happened quickly and none of the major social trends happening before or since the transition period have had much impact on wage compensation. The hypothesis that this change was the result of the rise of two paycheck families doesn’t fit this pattern. Woman entering the workforce would have had to started abruptly in 1973 and end by 1981. Of course we know that woman were entering the workforce much earlier and the trend wasn’t complete by 1981. It is also difficult to imagine how this phenomenon would actually cause a persistent structural change in worker compensation over the decades. The relatively brief transition, represented in this graph, also rules out other long term trends that are often cited by economists as reasons for lower wage compensation. For example, it’s often said that globalization of our economy accounts for the wage/GDP disparity. It is true that globalization affects employment rates and puts downward pressure on American worker incomes, but the trend itself is also a longer, slower process that doesn’t fit the pattern. Even the process of shipping business operations overseas took place over a longer period of time. None of the explanations offered by most economists seem to fit the narrow window in which hourly GDP and hourly wage compensation diverged. Seven years is a short period of time to bring about such a persistent structural change of this magnitude. Something big must have been happening at the time. What was it? Consider what was happening in the 1970’s. This was a hyperactive period for Nixon era conservatives which gave rise to the new conservative movement, also known as the Neo Con’s. They laid the groundwork that swept Ronald Reagan into office in the 1980. This was a time of rapid formation of organized business associations and industry trade groups. This was unprecedented in our history. It was the business answer to the growing influence of organized labor. These associations and trade groups pooled the considerable resources of big business to create the powerful business lobby we have today. They embarked on a massive anti-union marketing blitz to demonize unions and turn public sentiment against them. In 1973 the organized muscle of the newly formed corporate lobbyists got congress to pass legislation creating political action committees (PACs) which gave big business a means to funnel large sums of money into candidates political campaigns. At the same time, the coordinated collision of big business, with a nod from business funded politicians, weakened the effectiveness of collective bargaining. Businesses everywhere were emboldened to end the practice of sharing their profits (wealth) with their employees. In a span of less than a decade nearly all productivity raises ended for most Americans. All the new wealth (profits) generated since then have gone to top executives and wealthy business investors. The “raises” most employees received since this structural changes were merely cost of living adjustments. Adjusted for inflation, most American families are making today what their parents family made decades ago, yet the nation’s wealth has more than doubled. The median income of a family of four today is around $51,000 per year. It would be over $100,000 per year if wage compensation had continued to rise proportionally with the wealth we produce. Regarding the second point about (#2), expanded social services and income eligibility caps creating a disincentive to work: I have addressed this topic in previous articles. This disparaging of social supports for the economically disadvantaged echoes a frequent conservative talking point. It goes by many names, such as the “welfare state” or the “nanny state. ” It promotes the idea that there is a giant dependency on social welfare programs. But this attack on working families distracts from the fact that a growing number of people require government aid to the working poor to maintain basic stability. Their plight is a direct result of lower worker compensation caused by premeditated structural changes in the 1970’s. It hides the fact that subsidized assistance to working families allows corporations to have lower labor costs and higher profits. (A government supported labor force is a hidden corporate subsidy.) It dismisses the power of higher wages as a motivation for people to work hard and inspire hope for a better life. It obscures the fact that many companies have found ways to exploit the poor to profit off taxpayer subsidies. Most disturbingly, it blames this suppressed wage compensation on its economic victims. America Workers Needs a Raise! September 7, 2015 10:44 am / 5 Comments on America Workers Needs a Raise! I’ve been saying it for years. (and Bernie Sanders, who is running for President, has apparently been saying it for decades. )… American Workers Needs a Raise! In the period of just a few short years, beginning in 1973, employers stopped giving workers productivity raises. Since then, almost all the raises workers have received were merely inflation adjustments, not rewards for their growing productivity. All those rewards suddenly went to those at the top. The effects of this on the economy are compounded over time. Forty years of this nonsense has brought us most of the economic ills we experience today. The fact that “growing the economy” no longer results in rising worker compensation has been lost on politicians in both political parties. In fact, almost every policy initiative to “grow the economy” has made matters worse. It has often meant slashing taxes for the wealthy (trickle down theory), granting tax breaks for big businesses, and creating tax loopholes for the “job creators” so they can do their thing. Well, their thing is to get substantially wealthier. Almost all new wealth has gone to the top while the wealthy hide more and more of their assets in tax havens. State and local governments can hardly manage to patch up the potholes on our streets because of the combination of tax breaks for businesses and subsidies for the expanding numbers of working poor families. The Economic Policy Institute has released yet another report on why most of us are not feeling the love from the Wall Street economy. I have take liberties with their findings to condense them a bit so their impact is clearer. From the end of World War II until the mid-70’s, inflation-adjusted hourly wages and benefits rose in step with increases in our growing hourly GDP, which measures our economy-wide productivity. This parity between wages and productivity created the middle class. Since around 1973, hourly compensation has not risen with productivity grown. In fact it almost stopped very abruptly. 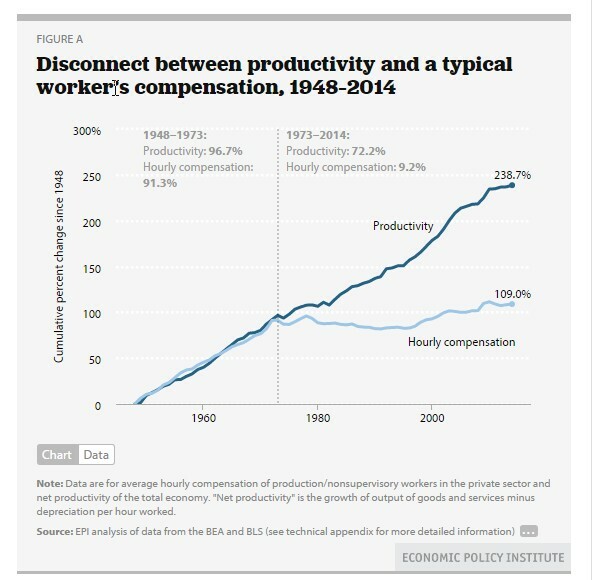 Net productivity grew 72% between 1973 and 2014 while inflation-adjusted hourly compensation for most of us rose just 8.7%. America’s Net productivity grew 1.33%annually between 1973 and 2014 while hourly worker compensation grew at just 0.20%. Since 2000, the gap between productivity and pay has risen even faster ( 21.6% from 2000 to 2014 vs. just 1.8 % rise in inflation-adjusted compensation). Since 2000, more than 80 % of the gap between a typical worker’s pay growth and overall net productivity growth has been driven by rising inequality. Between 1973 and 2014, rising inequality explains over two-thirds of the gap between productivity and worker compensation. If the hourly pay of typical American workers had kept pace with rising productivity since the 1970’s, there would have been no rise in income inequality during that period. Our rising productivity in recent decades provided the potential for substantial growth in wages for most American workers but this new wealth went instead to the riches segment of society. Policies to encourage wage growth must not only encourage productivity growth (the “we must grow our economy” argument) but also restore the link between economic growth wage compensation. Just growing the economy by itself doesn’t fix the economy for most working Americans. Finally, economic evidence shows that the rising gap between productivity and pay is unrelated to the typical worker’s individual productivity, which has also been rising.